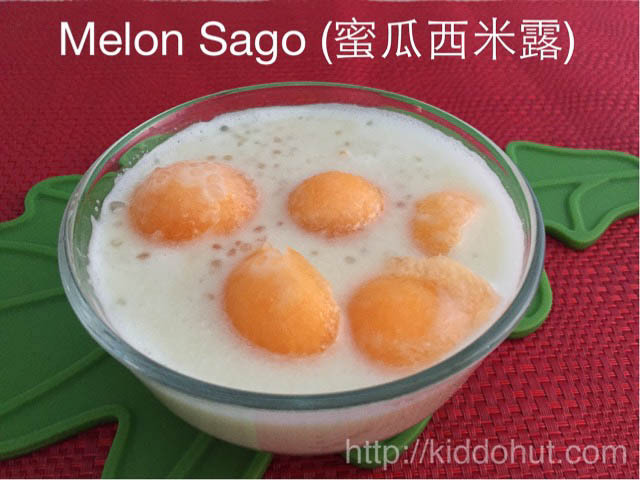 Melon Sago Dessert is a dessert that is similar to Mango Pomelo Sago which I have blogged last year. Both require no cooking (apart from cooking the sago), chilled dessert, fruit-based and taste really nice with lots of Sago! 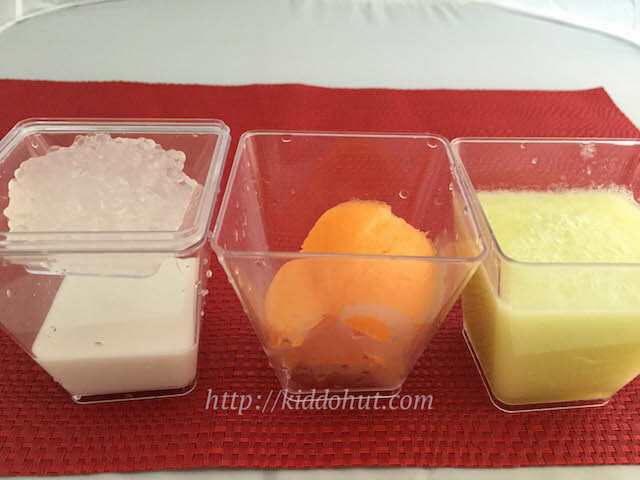 This dessert is also commonly known as Honeydew Sago or Rock Melon Sago. The reason for naming this as Melon Sago because I couldn’t decide if I want to eat honeydew or rock melon. So, I decided to have the best of both worlds: Rock Melon flesh with Honeydew juice. Some recipes use fresh milk, some use condensed milk and mine uses freshly-squeezed coconut milk. Anything with coconut milk is definitely nice, isn’t it? I used the traditional method of extracting the coconut milk. I bought S$1 of grated coconut from the stall in the wet market, added some warm water to the grated coconut and squeezed out the coconut milk through a cheesecloth. In case you have added more water than you need, and managed to squeeze out much more milk. Let the coconut milk set for 15 minutes, the coconut cream will rise to the top. Scoop out the cream for this dessert and keep the thin milk for cooking soup or curry. The proportion of coconut milk to honeydew juice is up to individual’s preference. Personally, I find that 300ml of juice to 100ml of coconut milk is just nice, the coconut milk does not covered the aroma of the honeydew yet one can still taste the coconut milk. Instead of adding sugar to the coconut milk, I made sugar syrup and add the syrup to the honeydew juice coconut milk mixture. This enables me to control the level of sweetness and cater to individual’s preference. I suppose this is the only cooking that is required here, beside cooking the sago. Making sugar syrup is really easy, just boil 1 part of water to 2 parts of sugar. There is no need to add water when blending the honeydew into juices. 500g of honeydew yields approximately 500ml of juices. Last but not least, add 1-2 pinches of salt to the dessert brings the greater sweetness of the fruit. 1. Add 200ml of water to the grated coconut, mix them well. Squeeze out the coconut milk hard through the cheesecloth. Set aside in the fridge. 2. Dice to small cubes or scoop out semi-ball shape of the rock melon. Set aside in the fridge. 3. Cut the honeydew to small pieces and blend into juice. Set aside in the fridge. 4. (Cook Sago) Boil the water in a pot. Once water is boiled, put in the sago pearls and turn to medium heat. Stir occasionally. Cook for 10 minutes. 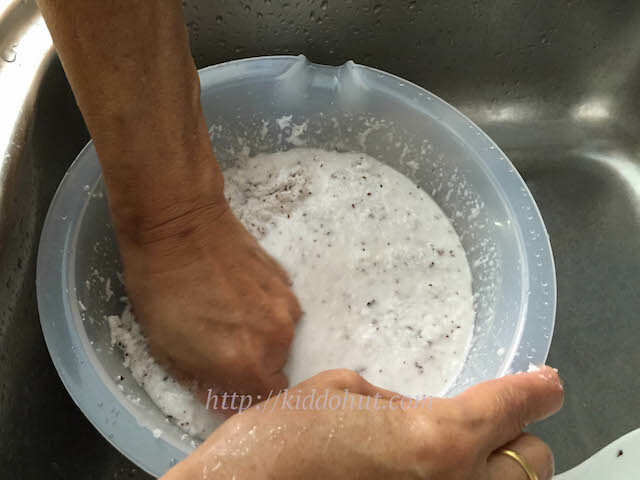 Drain the water using sieve and run the cooked sago under running water to remove the starch. Set aside. 5. (Make Sugar Syrup) Melt the 2 parts sugar in 1 part of boiling water. 6. Assemble the dessert by adding the coconut milk to the blended juice to desired taste. I added 100ml of coconut milk to 300ml of honeydew juice. Then add the sugar syrup. 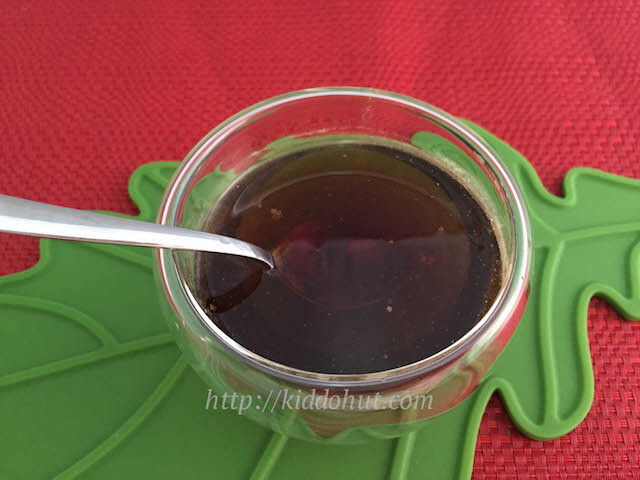 In my recipe, I added 4 teaspoons of sugar syrup. It really depends on the sweetness of the honeydew. If you are using rock melon for juice, you probably require less sugar syrup. 7. Next, stir in the cooked sago (add as desired). If the cooked sago is still very sticky and in lumps, just run them under water to “split” them. 8. Add 1-2 pinches of salt and rock melon cubes / balls. Serve.